On February 28th, 1999 I was driving East bound on I-90, when fate intervened and upped my engine rebuild schedule by at least 9 months. I was in third gear at 6500rpm and beginning to shift up to fourth when disaster struck. As I lifted my foot from the throttle, disengaged the clutch and began to perform a slow, synchro-saving shift, I realized that I had a problem: the throttle stuck wide open and my poor engine was doing its best Formula 1 impersonation. I quickly reached around the steering wheel and turned off the engine but it appeared I was too late. After I came to a stop on the shoulder of the freeway, I tried to restart the car to see how she sounded. There was a hellacious rattle that seemed to indicate I had bent at least one valve -- not good. Fortunately I had brought my cell phone, so I called AAA to arrange for a tow truck to take me and the Alfa home. Later that week, I pulled the cam cover and noticed that the chain tensioner had receded into the head, which resulted in a great deal of slack in the upper timing chain between the intake cam gear and the main pulley. Hmm... Some friends suggested that I try to start the car again to see what would happen -- after all, they wouldn't have to pay for any additional damage that activity could cause, so it seemed like a great idea to them. I figured what the hell, it's only a credit card...er, I mean money, and so I tried to start her. She turned over just fine, but didn't fire right away. This seemed to indicate that the rattle I heard was not a bent valve, but rather chain slap resulting from the slack I had seen earlier. I then tried to start the car again and suddenly the starter just spun! Not good. Turns out that I had sheared off all six flywheel bolts at the crankshaft! At this point I decided it was time to rebuild the motor and finally get some decent power out of the car. Wes Ingram agreed to do the rebuild and also to let me help assist him. Typically, this kind of arrangement results in a mechanic upping his hourly rate by 100%, but Wes isn't your ordinary engine guru. Although internationally known for his work on Spica pumps, he also knows a great deal about Weber carburetion, which was fortunate for me. 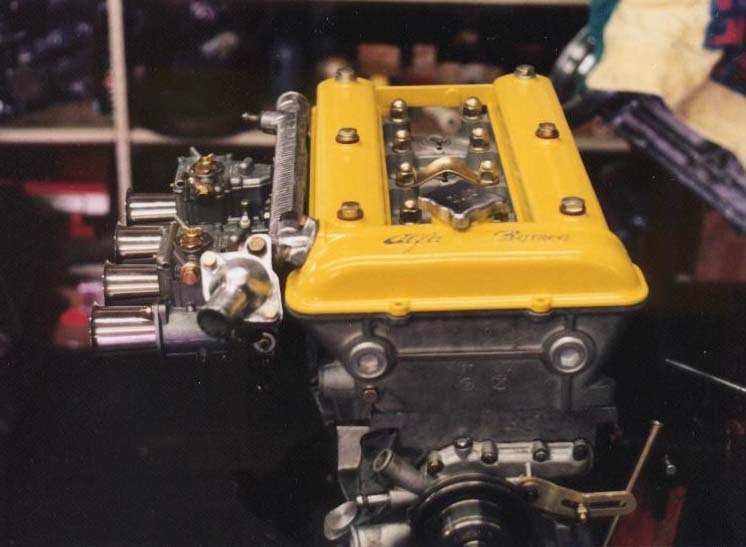 Since my car was a Euro motor, the cost of converting it to Spica was prohibitive -- roughly equal to installing a fully programmable, electronic injection system -- so I opted to replace my Dellorto 40 DHLAs with Weber 45 DCOEs and revel in the sound of big old sucking carburetors. Take that Ralph Nader! Removing the engine was done in a friend's garage and was actually very easy. Well, that's not entirely true. 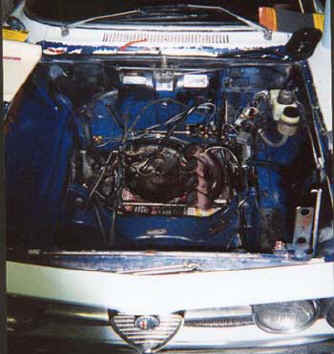 The whole process that lead up to physically removing the engine from the car was straight forward. However, attaching the chain to the motor and pulling it out with a cherry picker was a great excuse to practice my swearing. it was really heavy and really heavy things were always really important? Remember how you heard your dad's car pull into the garage and how you thought that if he caught you before you confessed, you were dead meat? Remember how you then decided to do the only honorable thing, no matter how hard it was to do? Remember how much trouble your little brother got into when your dad finally found that transformer hidden under his bed later that night? markers won't smudge or smear on a zip lock bag, the ink will disappear if you accidentally spill brake fluid all over the labeled bags. Trust me on this one. A broken engine mount (right) explains part of my rough idle problem. I have what I refer to as The Rule of Three. Whenever I am budgeting time to do something, I always make an educated guess on the length of time required and then multiply it by three to come up with an accurate estimate. Throughout my life, I have always found the application of this rule generates remarkably accurate estimates. Be it project work, car repair, taxes, or just successfully explaining why I should be forgiven for forgetting her birthday, this system has always worked. 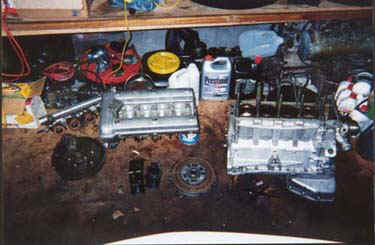 Over the course of this engine rebuild, I have adopted a new rule: The Rule of Ten. 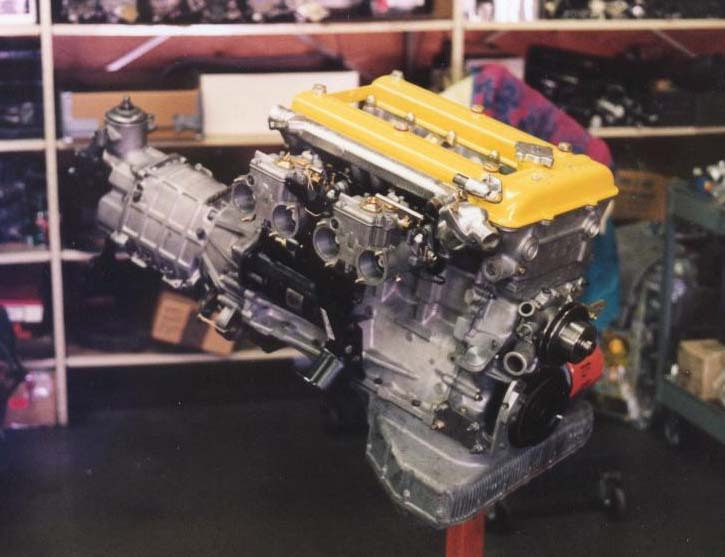 As a number of people have subsequently told me, building an engine to race standards and incorporating technology that is not typically found in that application, is a recipe for a long project. After nearly three months, the car was running, but then another long process ensued to track down all the little bugs that had invaded the car during her long hiatus from the road. 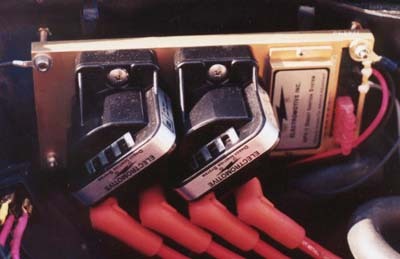 power wires that feed the computer. 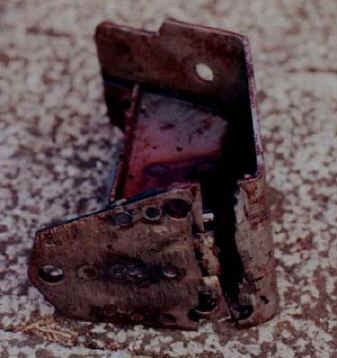 Wes came up with a very simple yet effective solution: he used studs attached to the firewall and placed nuts about 3/4" from the ends to make a simple platform to rest the HPV-1. 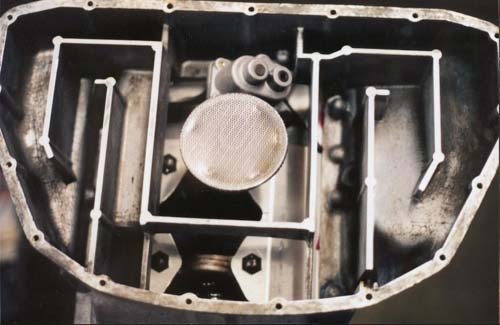 This is a view of the bottom of the engine with the lower pan removed. Notice the curved sides of the windage tray. 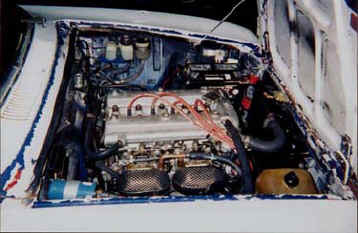 The Motronic 10:1 pistons in place. 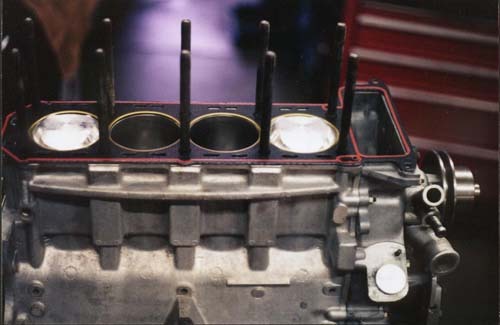 Although 10.4:1 pistons are also available, their high dome hinders breathing and reportedly don't make any more power. If you look closely, you will see the crank-fire sensor bracket located to the left of the crank pulley.